When I got offered an ARC (Advanced Reader Copy) of this book to review, I was unsure if I should take it up, as it was way out of my comfort zone (so far out that I couldn’t even see my comfort zone from there!). Books on spirituality and spiritual journeys are not my thing. Not because I don’t believe in a higher spirit. I do. It’s just that most books written on this topic are either immensely dull and boring, or I find them hard to relate to. So I was extremely wary of this one, but I went for it nonetheless. Best. Decision. Ever. You can check out the detailed plot summary or blurb over here , but I don’t think it’s necessary (I went in blind, and preferred it that way). The tale is simple and timeless – it essentially revolves around a man’s search for meaning. So if there is birth, age, suffering, sorrow, and death, then there must be something that is un-born, un-aging, un-ailing, sorrow-less, and death-less, immortal as it were. Yet, it’s very difficult to accurately summarize. Mostly because, it’s a journey that can be interpreted in many many ways. I don’t teach anything, Mahadeva. I just live here. So you alone decide what you want, and understand what you get. When I started reading this book – I had little to no knowledge of yoga, and had little to no interest in acquiring that knowledge. Also, like I said before, while I do believe in a superior spirit, I was never interested in reading about spiritual journeys, because I used to find them dull, repetitive, predictable, and extremely hard to relate to. This book has made me do a complete re-think of my stance on this. Firstly, I have a much better understanding of the concept and practice of yoga, and I can’t thank the author enough for this. It was instructive, yet entertaining, and that is such a difficult balance to achieve! It was also easy to follow (even for someone like me, who has very little understanding of this science). Moreover, every single step that Max took, I could understand, and relate to. Which in itself is saying a lot, because I, and the character Max from this book, couldn’t have possibly come from more diverse backgrounds. His family migrated from Greece to US, and he grew up in the projects in NYC amidst gang wars and drug addiction issues among his peers. I was born and brought up in Mumbai, India (and eventually moved to US), where I have lived a relatively sheltered/protected life. So you see! And here I also need to mention that while I spent the first 25 years of my life in India, the India that the author took me to, seemed to be another place altogether. I lived in the metropolis of Mumbai; whereas this book took me on a journey across India – from the fleeting sights of Mumbai and Delhi, to a drought prone village in South India, and finally to the majestic Himalayan ranges. It was like seeing a familiar scene through different lenses. And such beautiful lenses they were! The author’s writing has this quality that breaks through barriers of time and place. It’s like you have apparated (harry potter allusion, yes) over there, and are actually living through the experience. 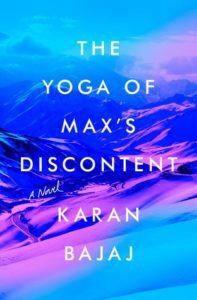 The Yoga of Max’s Discontent is a contemporary take on man’s classic quest for transcendence. It might look like one of those others – westerners looking for Nirvana type things- but it’s not that at all. It has a very authentic feel to it, and that’s pretty difficult to achieve. I can’t fully express how deeply this book has affected me, but I will say this – it has certainly compelled me to look into yoga as a way of life ( for health and fitness), and for that alone, I am eternally grateful that the author chose to write this book. Needless to say – I highly recommend it. To everyone. Yes, everyone. Whether you practice yoga, or are only remotely aware of it (like me) – this is one enriching experience you will treasure for a long time. This book has made me extremely curious about the practice of yoga, but I am lost as to where to begin. I do have some idea (very superficial), and I am aware of the phenomena that is Youtube, but I am looking for some kind of structured program – preferably online, but even a DVD that I can follow, will work. If you guys know of any such channel on Youtube, or a DVD that you have tried and found effective, please do share. It will really help me out. You haven’t spared anything, have you? I can actually hear you gushing right now 🙂 What a lovely review and a dream one for any author. Sigh. Spirituality is actually a genre that greatly fascinates me so this may go very soon on my TBR. Now I KNOW I shouldn’t publish my book 😛 Quaking in my boots, as it were. Shailaja Vishwanath recently posted…Are you attached to your writing? What a nice review! You could start learning Yoga through a Guru (trained) who’d help you in every step – mental and physical. Speaking of Gurus – I don’t know how to distinguish between the real ones and the fakers. Sigh. Beautiful review Shantala!!! You might just want to start with the very basics like surya namaskar, kapal bhati, anulom vilom and simple breathing techniques. These will make it easier when u move on to the advanced stuff. Nope, not dull at all. This one kept me hooked. Having said that, sometimes it is about timing too. While I was wary about the genre, I think at this stage of life, I was more receptive to it. Hema recently posted…I’m on The Huffington Post!! Wow, you were a student of BKS Iyengar! I now before thee. ? P.S. The yoga bit and the spiritual bit are pretty entwined in this one, so I am curious to know what you will think of it, if and when you read it. Let me know. I will, I will, Rachna. Thank you so much. I too found Baba Ramdev’s videos on this very good. I am just starting out, but I am sure this will stick. I will ensure it. Oh that’s awesome. Which class? Where? Wow:) Loved the review and I just might buy it on amazon. You have done a great job and am sure the author has too. Thank you so much, Sunila. I am glad you liked the review. The author has done a fab job with this one. If you like the genre, this book will not disappoint. That good? I should get it then. I am wary of such books after I didn’t quite like Eat Pray Love – that idea of a westerner coming to India in search of nirvana. Is it anything like that? But yoga is something I would like to have a go at. Recently I tried it and it turned out all wrong for me – too crowded and too impersonal. I have been already contemplating giving it yet another try – this one is for me, then. Thanks Shantala. Whether you read this book or not – do give Yoga another shot. I believe there is serious merit there. It just takes dedication and patience to learn, very much like anything else that is worth learning. Sure will. I did it once for over a year and found it really really good. But then I did it with just another friend and an instructor who came home. I’m not comfortable with the idea of yoga in a room packed with people. It’s a more solitary endeavour than maybe something like zumba where the crowd gets you going. So I’ll probably look out for a small batch if not a personal instructor. Beat About the Book recently posted…Do you judge a person by the books he reads? 5 stars from you? I have to check this book out, Shantala. 🙂 Thanks for sharing! hey, that’s a good review. You have done a good job. You have induced in the reader a need to get the book. Trust, it is as enticing as you have mentioned. But then, since you have read it and reviewed it , am sure, the book is very enticing. I’m not into spirituality or seeking but definitely love doing yoga (when I can) so may be this is a good book for me to read right now. Currently I don’t have much time to read and only read what is worthwhile…..Incidentally have you started standing on your head??? Standing on my head? Nope, not yet. I thought that was a more advanced pose. I started with the basic breathing exercises and the downward facing dog – adho mukha svanasana. I’ve this books on my sights since May! So happy to see you glowing review. I’m also not very fond of books about spirituality because they can be boring, but you’ve convinced me to read this book. Naz @ Read Diverse Books recently posted…The Ultimate Diverse Reading List: Over 300 Book Recommendations! This one, I do hope you are able to check out. Would love to hear your thoughts. So glad to see that you loved this one. I still have to read it. I loved the author’s previous (Keep off the grass), which I read during my college years so I had a big connection with it. This one sounds just ideal for my current phase of life. I haven’t read anything else by this author, yet. But now I surely will look up more by him. I was considering The Seeker, but will check out Keep Off The Grass too. I have read the same book, but with a different title.This book is also titled “The Seeker”. So so glad to know that it has affected you deeply too. I too do not consider myself a deeply spiritual or religious person, but this book changed me profoundly! In a fit of enthusiasm, I ended up reading the other two books penned by Karan Bajaj, and they did not live up to this one:(. You know, now that you mention it, I looked up The Seeker – the plot, blurb, everything. It seems to be the exact same book, in a new wrap. There are possibly some improvisations, but I find it peculiar, have not seen this kind of re-release happening much. Shanaya Tales recently posted…What is the impact of a movie like Sairat?